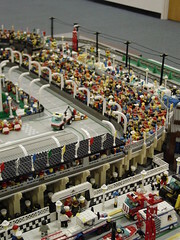 Uploaded 257 pictures last night from BrickFest 2005. Tried uploading them to BrickShelf, but had some problems... I'll try uploading the rest tonight. I took the first 50 or so pictures; the rest were taken by one of my COLTC friends -- I didn't have time to get around to all the rooms to finish taking pictures, so my co-COLTCer was nice enough to snap a few.